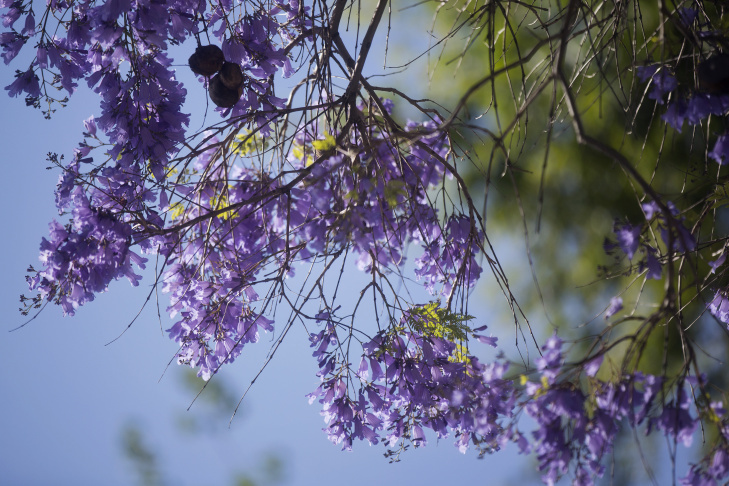 Jacarandas bloom early on Thursday, April 16, 2015 along Del Mar Boulevard at Waldo Avenue in Pasadena. 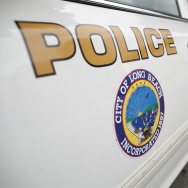 You may have noticed that Southern California's signature blooming trees, the jacaranda, have been putting forth their lavender blossoms earlier than usual this year and in recent years. To understand what may be causing jacaranda trees to bloom earlier, we travel a winding road, from Southern California to the Southern Hemisphere. Here's what we found out. 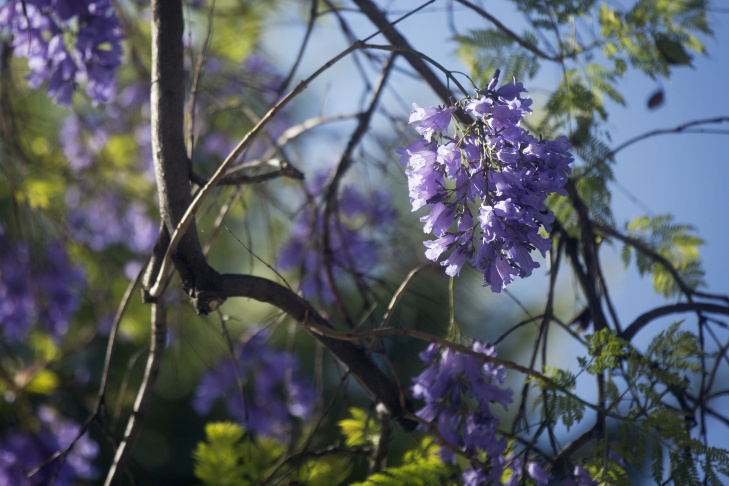 Right now in L.A. and Orange Counties, you’re seeing trees with trumpet-shaped flowers explode in shades of purple. 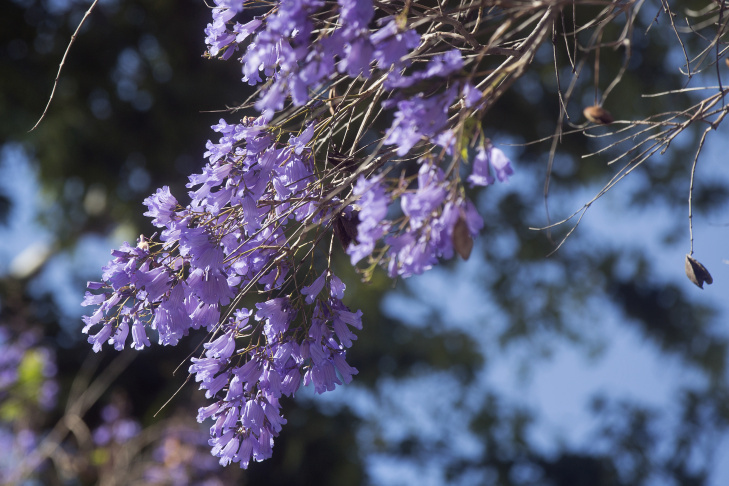 Santa Monica resident David Pettit knows those shades well – there’s been a jacaranda behind his house for 33 years. Helen Norris, a recent transplant from Northern California to Orange, has lived here a year. But the jacaranda made an impression on her even before she moved. By most accounts, jacarandas in Southern California have bloomed in late May and early June most years. But Pettit says that hasn’t been the case the last couple years. Norris says she and her friends have been talking about jacarandas, too. They think the blooms have come “a wee bit earlier” than last year. “The other thing I notice is they’re blooming, but they seem to be dropping their blooms pretty quick too,” she says. All of this leads Norris, Pettit and other observers to ask what’s going on with jacaranda blooms. “Are we going to move earlier and earlier? 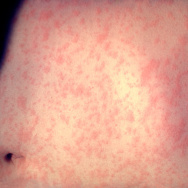 The tree seems healthy and all that, but I would guess that at some point, it’s not going to be anymore,” Pettit says. Frank McDonough is the go-to guy for botany questions at the Los Angeles County Arboretum. I asked him what April blooms mean for jacarandas. McDonough says an early, warm spring may have caused the early bloom. 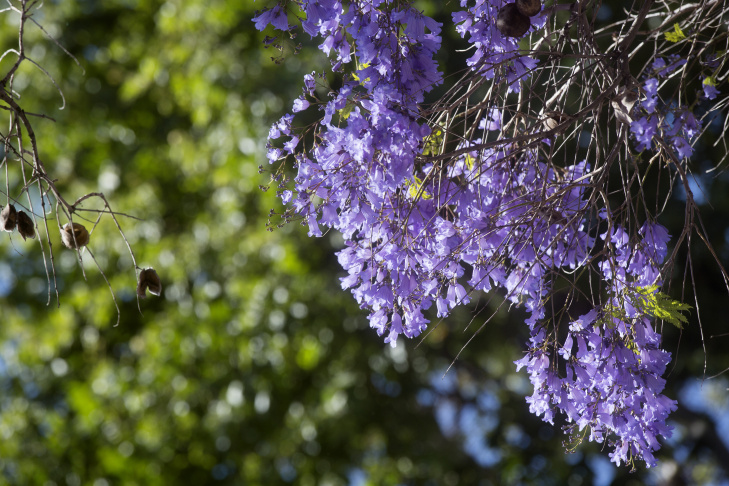 But it’s hard for him to say more than that, such as whether blooms are connected to a larger pattern; the arboretum doesn’t have much data on jacarandas because they’re not native here. Jacarandas are from South America, particularly Argentina and Brazil. 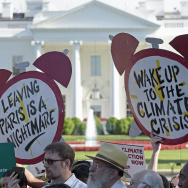 But it’s in Australia that scientists and citizen observers have started to connect early blooms to climate change. Like Angelenos, Australians have adopted the tree as an icon. Brett Summerell is a researcher at the Royal Botanic Gardens in Sydney. He says Australian students used to have a bit of lore linking when to study with when the purple blossoms come in. Not anymore. Slacker students in Sydney probably still have time to hit the stacks if jacarandas are in bloom because it’s happening earlier now. Summerell says volunteers at the botanic gardens started tracking the bloom cycle of the trees nearly two decades ago. He himself has wandered under them, recording data about first flower and full bloom. And thousands of people now send the Australian government data. Together, these observations show jacarandas blooming as much as four weeks earlier than usual. Summerell admits the data set is imperfect and still young. “There’s lots of peaks and troughs with all of this biological response to climate change type of data,” he says. 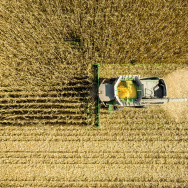 Still, the records seems significant to him and to Andy Pitman, an atmospheric scientist at the University of New South Wales, who’s particularly interested in the way climate change influences vegetation. 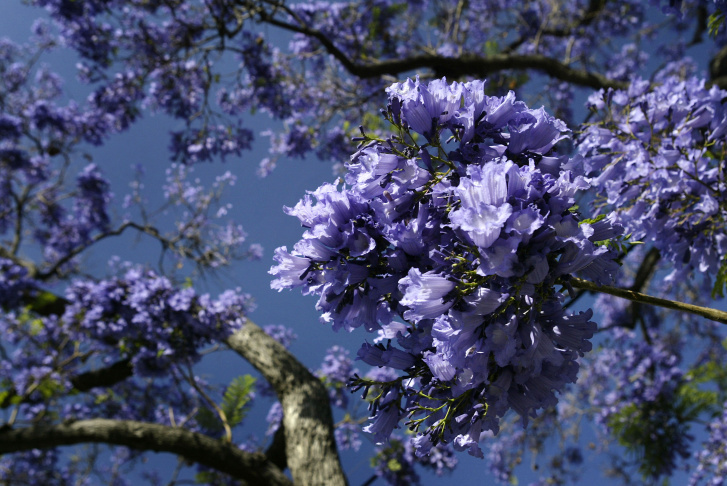 Pitman says winter has long been a crucial part of the jacaranda life cycle. But that sleep is being disturbed. 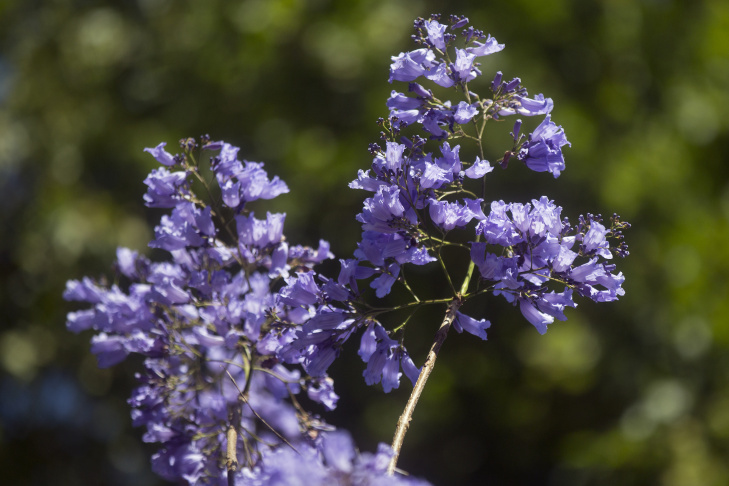 Jacarandas rely on cues from soil moisture and soil temperature to figure out when to bloom. Pitman says warmer, drier winters are scrambling those cues. “And that’s completely changing their cost-benefit analysis to cope with winter, and that is what you are seeing,” he says. The last decade was the hottest on record in Australia, a period when the country also battled a serious drought. Pitman says if the Australian experience is any indicator, Californians should drink in the blooms now. In the depths of the drought, a few years back, jacarandas there faded quickly.